This page houses information on different traffic safety topics meant to enhance travel experiences for motor vehicle operators, bicyclists, and pedestrians. With campuses in a busy, urban area, UW-Madison and UW Hospital see steady traffic flow throughout the year. Let’s work together to make campus a safer place for everyone! Slow down; watch for and obey traffic signs. 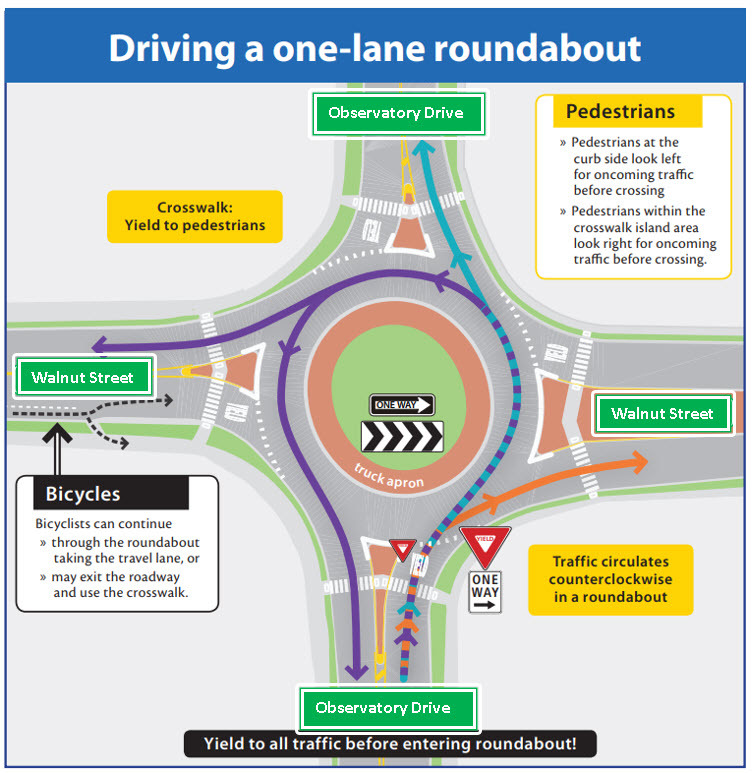 Move into the correct lane for the direction you want to travel as you approach the roundabout. If you are riding in the bike lane or on the far right side of the street, merge into the traffic lane before the roundabout begins. Example of a one-lane roundabout on the UW-Madison campus, at Walnut Street and Observatory Drive. Campus is a busy place–an urban campus means traffic flows through UW-Madison at all times of day. People get around using a variety of methods: walking, taking the bus, biking, driving, and more. Make sure you know traffic laws to help ensure your safety and that of others. Obey all signs and signals – pay attention! Do not exceed the speed limit. Most UW campus streets have a 20 mph speed limit. Yield to pedestrians in marked and unmarked crosswalks. Give cyclists a minimum of three (3) feet of clearance when passing. Expect cyclists to sometimes take up the whole travel lane – it’s their right in many areas! Don’t drive distracted. Keep your eyes on the road and keep phones put away. Be vigilant at intersections (and in general) for unpredictable behavior of other road users. Follow all rules intended for motorists. In Wisconsin you are considered a vehicle! Ride in the same direction as motor vehicle traffic. Ride as far to the right on the road as you feel safe. Ride single or double file, but single up when other vehicles are passing. Look behind you before turning or changing lanes. Signal your intentions! Be respectful of pedestrians. Slow down and alert them when passing. If you must walk in the street, walk against traffic and, if necessary, step out of the road to let vehicles pass. Cross the street at a crosswalk. Obey pedestrian crossing signals where present. Make yourself visible to motorists and be vigilant at intersections (and in general) for unpredictable behavior of others. Mopeds and motorcycles follow the rules for motorists. Skateboards and unlicensed scooters are considered “play vehicles” in Wisconsin and do not have the right to operate on public streets. If operating on sidewalks or paths, you may not operate using power. Always proceed slowly and yield to other users.